Mass transportation,Saigon style. Note the number of passengers, luggage on top, small axle and tires. Makes a Greyhound bus seem luxurious! First assignment: Highway 19. Highway 19 cut across the center of So. Vietnam. 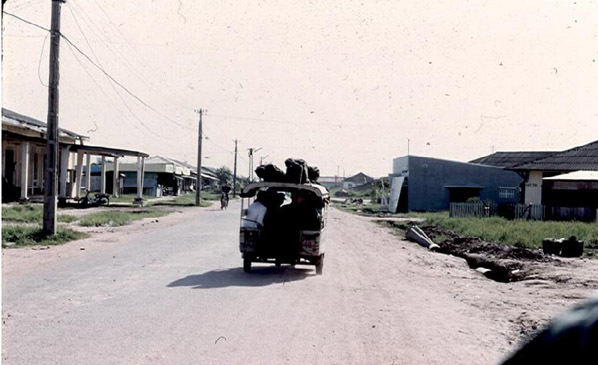 It stretched from An Khe, to Pleiku, to Qui Nhon. It was an important road for convoys, logistics and local farmers. 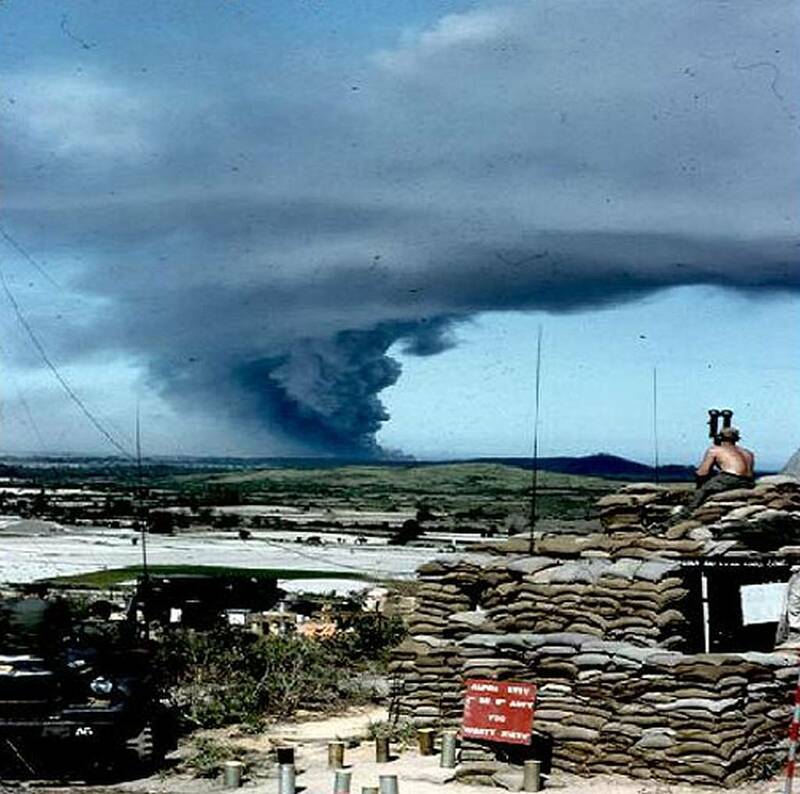 Consequently, the Viet Cong (VC) made a point of setting up ambushes to disrupt commerce and inflict casualties on the GIs and the locals. This, in turn, led to the reality of never knowing "when" or "where". On the ground view of Highway 19. Note the thick foliage ideal for concealing an ambush. The classic "L-shaped" ambush involved blocking the road ahead and attacking from the side(s) of the highway. 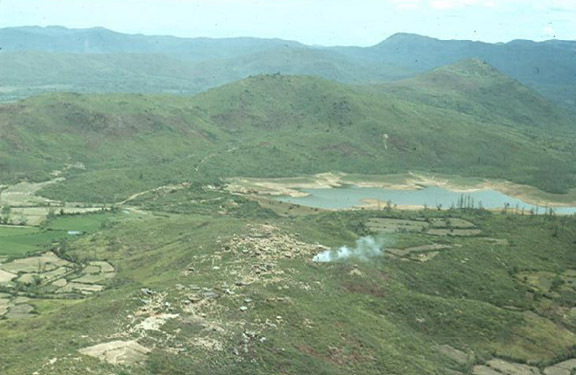 My best recall is that this tank was atop a hill near the infamous Mang Yang Pass. It may have also been the entrance/exit for one of the many tunnels found in South Vietnam. Main transportation in the field was by helicopter, all equipped with a Door Gunner and his trusty M-60 machine gun (shadows). Note view of rice paddies fed by canals. Quite a story here. Sign reads: "Boys & Girls Home" (orphanage). Below that, it says "Captain Ronald Rod". Capt Rod was one of my Loyola University ROTC instructors who went to Vietnam in the early 60's as an "Advisor" as the military was known then. Struck by the conditions there, Capt Rod sent home a plea for basic items of hygiene for the home (soap, toothpaste, etc). With amazing luck, I was able to find the orphanage (Duc Pho) and pose under the entranceway. Capt Rod was killed by the VC who were concerned that he was winning the hearts and minds of the civilian populace. 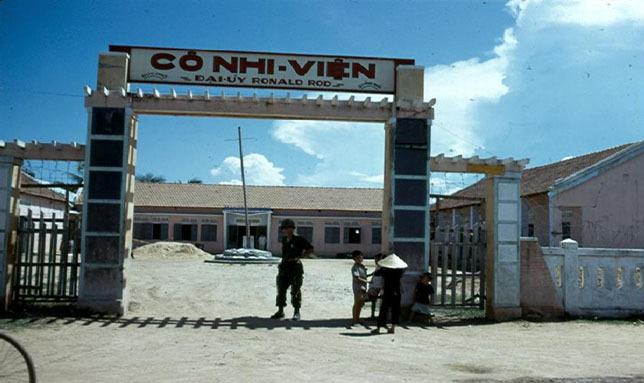 HQ, 3rd Brigade, 25th Inf Div, Duc Pho. 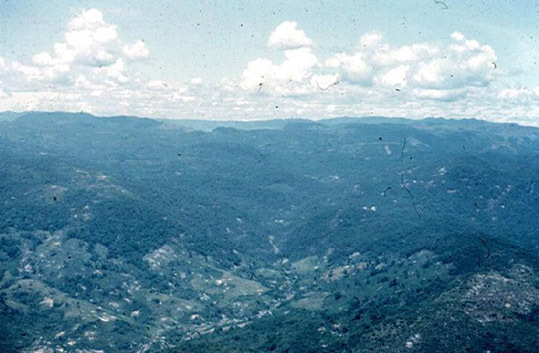 LZ Montezuma, Spring, 1967. 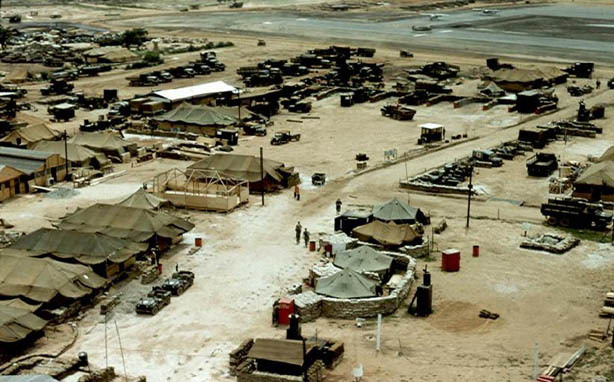 Construction of the Brigade Base Camp. 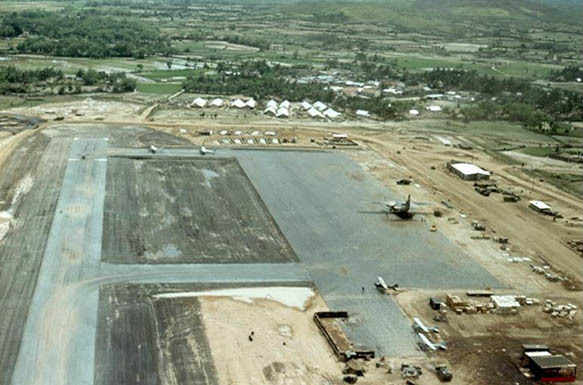 note runway at top and the use of wood, canvas & sandbags. Col James Shanahan, Commanding. 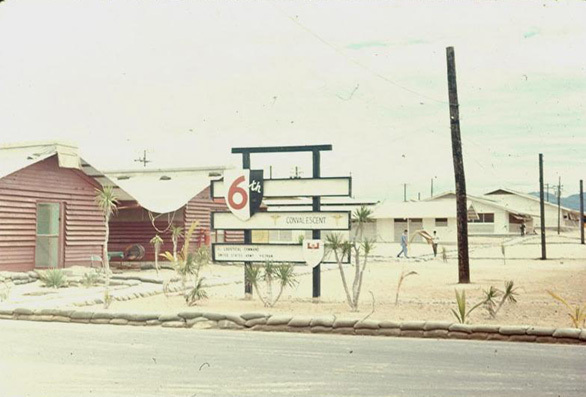 3rd Brigade airstrip. Lush green vegetation all around. View is the north end of the airstrip. The Caribou...one of the last aircraft operated by the US Army. 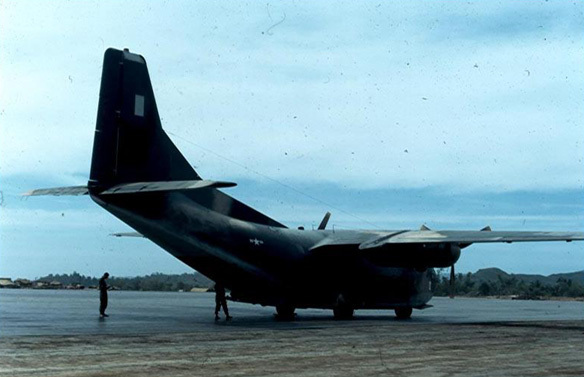 USAF C-123, the logistical workhorse of the military in Vietnam. 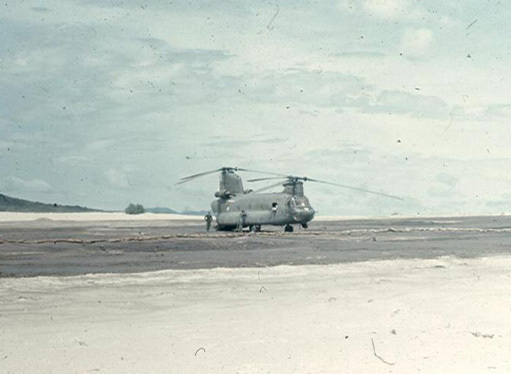 US Army's logistical workhorse, the CH-47 "Chinook". The helicopter is being refueled at the end of the airstrip from a "bladder". 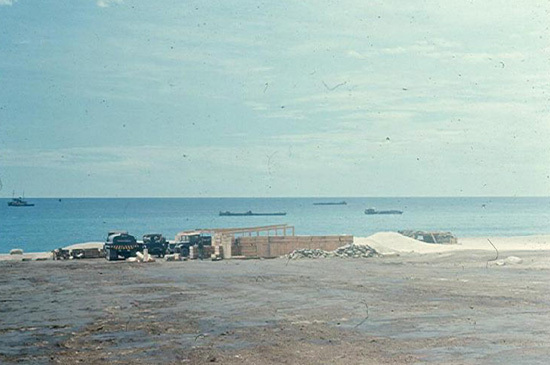 Construction of a large ammunition dump south of Brigade Headquarters. It later became the site of a "fireworks spectacular" caused by using an axe to cut the metal banding securing the munitions. Central Highlands A Catholic Chaplain shades his face while waiting for troops to gather for a mass in the field. Note altar kit sitting atop C-Ration boxes. 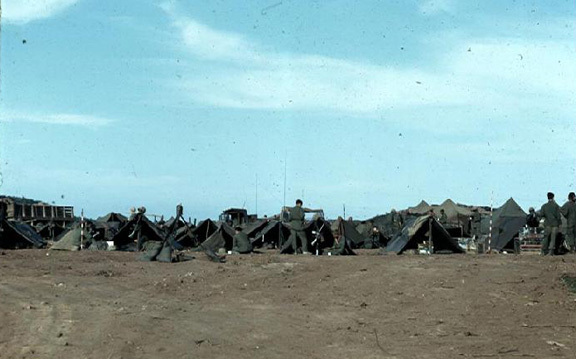 The area was a hastily-created "LZ" or "Landing Zone", one of hundreds throughout the combat zones. 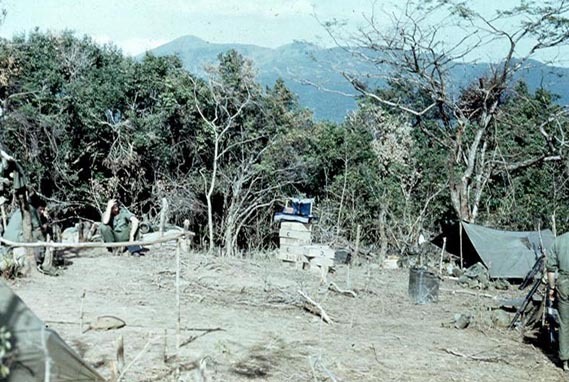 A captured VC (Viet Cong) is in the photo center, squatting. This was the classic resting posture of all Vietnamese. He was awaiting movement to an interrogation center. 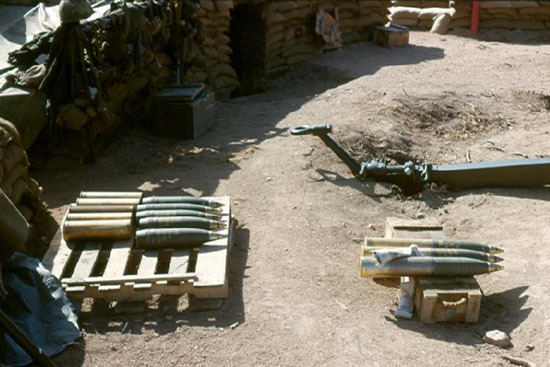 Troops look over captured mortars, usually of Russian or Chinese manufacture. Note the jungle fatigues, jungle boots and the M-16. 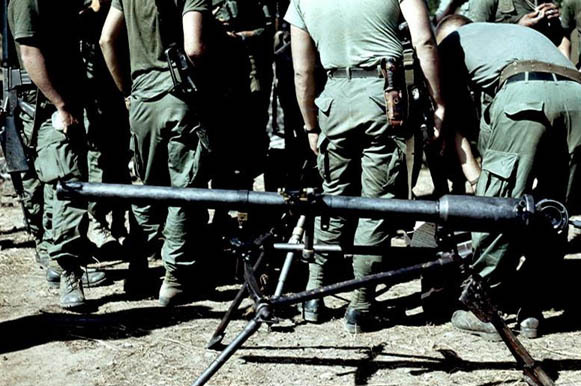 Captured enemy recoilless rifle. Quick, portable, powerful. Note troops wearing web gear, jungle fatigues, boots...and lots of tanned skin. Also note the jungle survival knife and the M-16 with short clip. 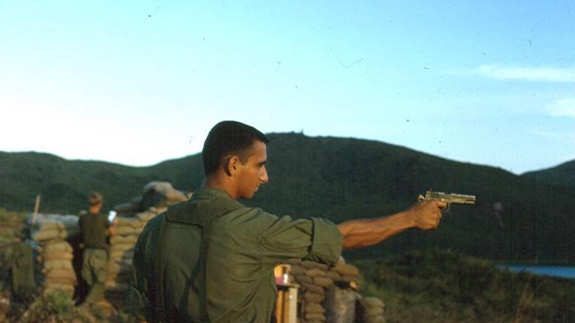 Highway 19 - Central Highlands Artillery FO (Forward Observer) on duty. The FO was assigned to "hump the boonies" with the "grunts" on every mission. The FO was the Infantry Company Commander's "pocket artillery" and was usually kept close at hand. 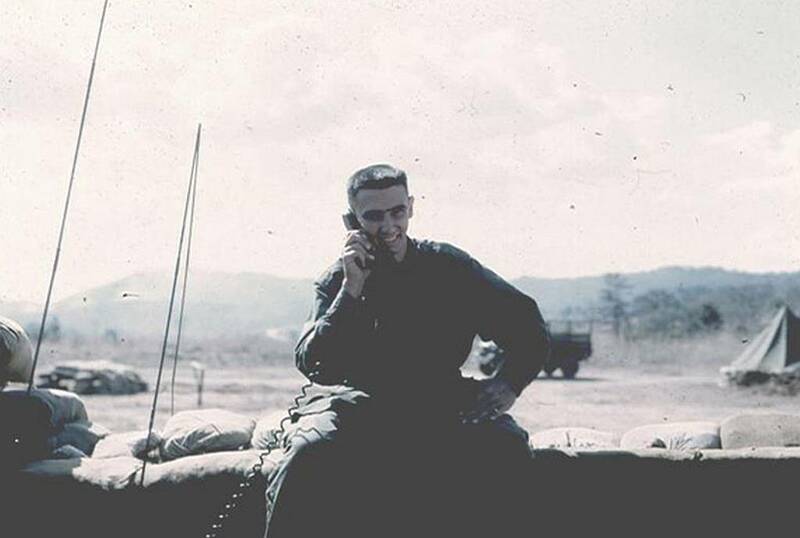 The FO traveled with an RTO (radio-telephone operator) equipped with a PRC-25 field radio. 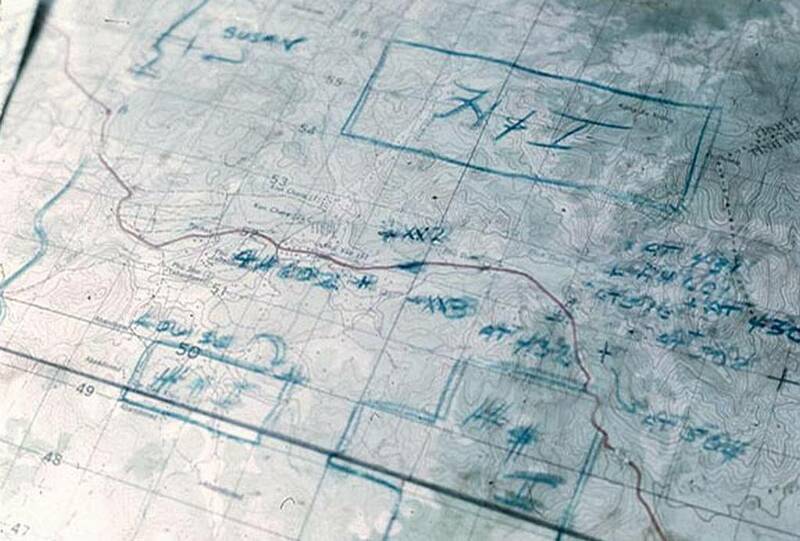 The FO was often relied upon to interpret the map and mark position movements...and most importantly, to call for fire (artillery support) when the need arose. "LZ OD", Artillery & Infantry Firebase. 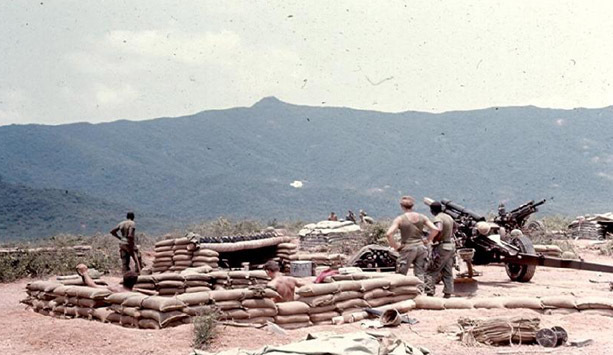 HQ for the 1st Bn, 35th Inf Regiment and Battery "A", 2/9th FA (105mm How). Spring - Summer, 1967 An early look at the development of LZ OD. The artillery unit occupied the southern end nearest the small reservoir. 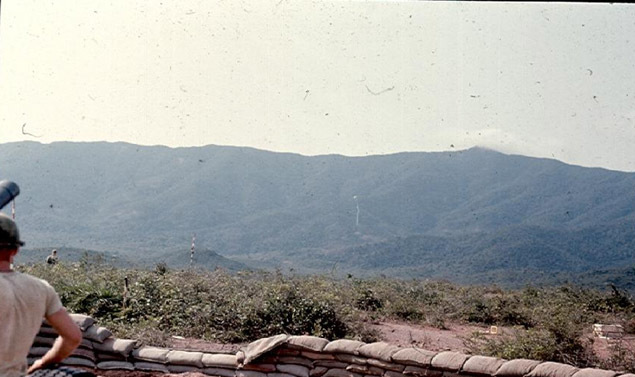 The 3rd Brigade HQ was due east of this photo, along the edge of the South China Sea. 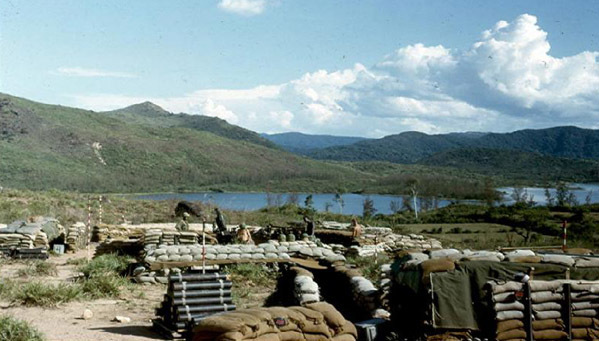 Note the extensive use of sandbags...number one lifesaver in Nam. 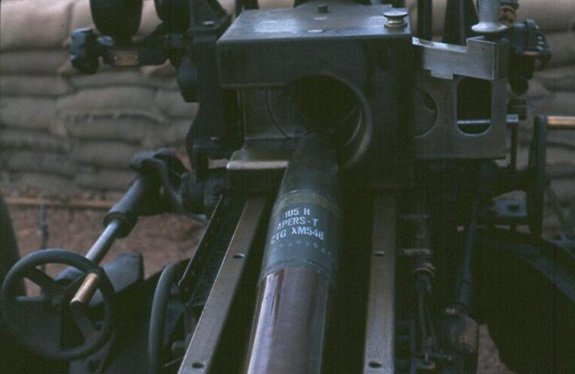 Black tubes with gray bands are 105mm howitzer rounds, complete with high explosive head, shell, and power bags. Red & White stakes are "aiming stakes" to set deflection for guns. View is facing due South. 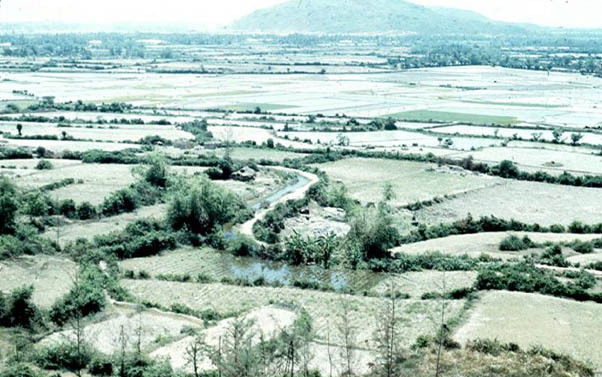 The lagoon fed the rice paddies to the east. Contents of the mysterious black tube...105mm ammunition. Gold tip is the fuze, green "bullet" is the high explosive (HE) and the gold shell contains 7 power bags. Note the "trail" of the howitzer is "dug in" to stabilize it during fire missions. Note the entranceway to the crew bunker, upper center. 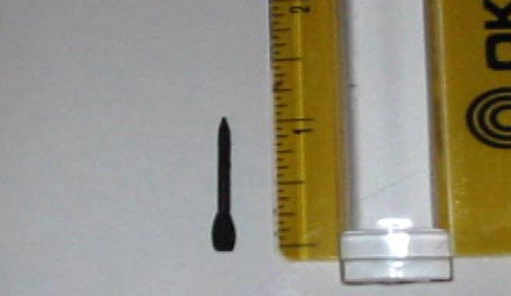 This menacing little piece of 1" gunmetal known as a "fleschette" was packed inside the "beehive" round. The round contained 8,000 fleschettes designed to discourage the enemy from "overrunning" an artillery position. The howitzer tube was lowered to the "direct fire" position and fired like a cannon of old...a great contrast to the calculations required for "indirect fire". In order to insure accuracy, the howitzers were "registered" every day. This involved an air observer selecting a target and directing the "base piece" (center howitzer) onto the target. Once there, the "target" data was recorded for future missions. Note the recoil of the howitzer tube and the use of "fingers" instead of earplugs...which weren't "macho" back then. 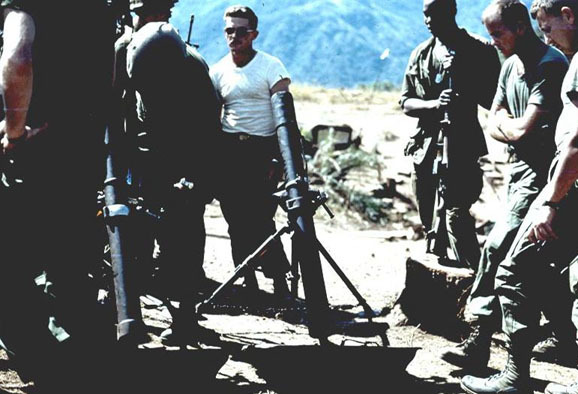 Field Artillerymen practiced their skills daily. Above is the trail of a "smoke round" indicating the path of the trajectory. 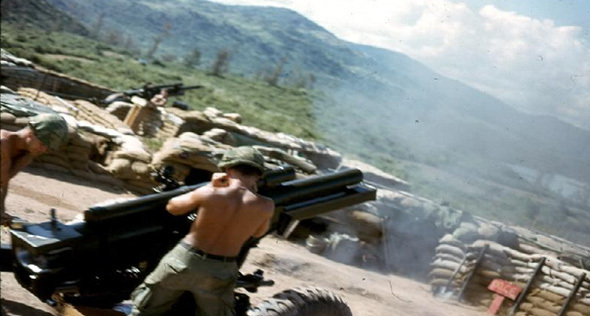 Smoke rounds were vital to the artillery efforts and the "grunts". It verified ground position and confirmed the location of the high explosive rounds when a unit called for artillery support. The "smoke round" has landed. Now you are ready to "adjust fire". Notice how the artillerymen dig in and improve their position. Stack of sandbags at lower right wait to be filled. Reel of commo wire nearby. 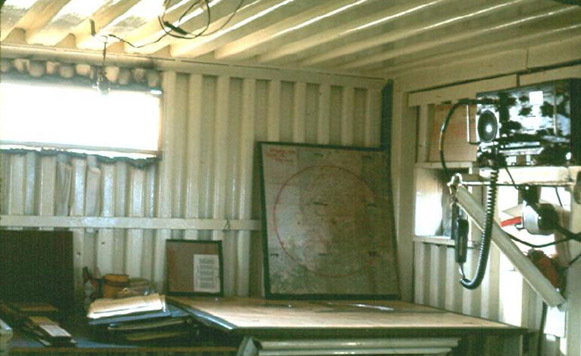 Note the "hut" in near center of photo designed to shelter the ammunition. Artillery pockmarks on the landscape. Reminiscent of the artillery ranges at Ft Sill, OK minus the greenery. A CH-47 (Chinook) delivers the supplies as an artilleryman gets in position to remove the "doughnut" (circular canvas strap) from the hook. 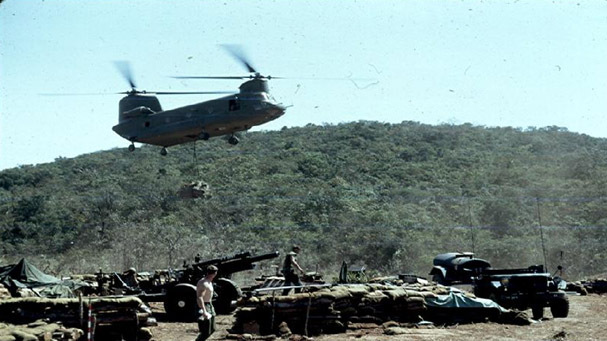 Although the supplies were very welcome, the task of loading and unloading the hook of a CH-47 was not a popular one. Static electricity came in to play as well. Besides the extremely critical role of logistics, the CH-47 Chinook had a whole nother personality...a gunship. 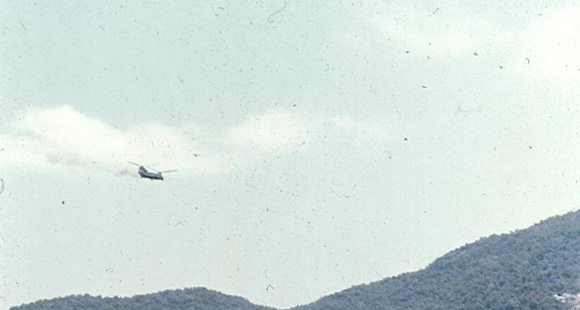 Often called "Puff, the Magic Dragon" or "Spooky", these gunships had tremendous firepower for their generation. Note target area in lower right. They were often regarded as the "next best thing" to having artillery rounds on a target. Artillery ingenuity...wood from ammunition crates and scrounged supplies became the basis for a classy mess hall. 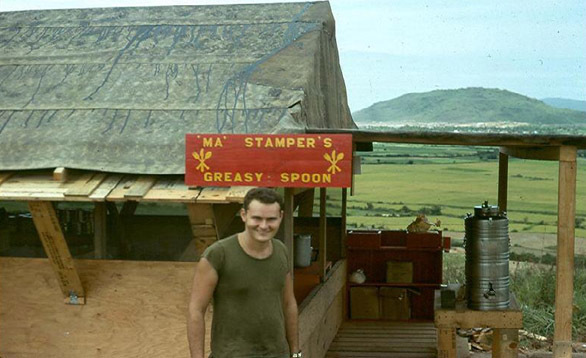 The cook, Sgt Dan Stamper, is right proud of his building. 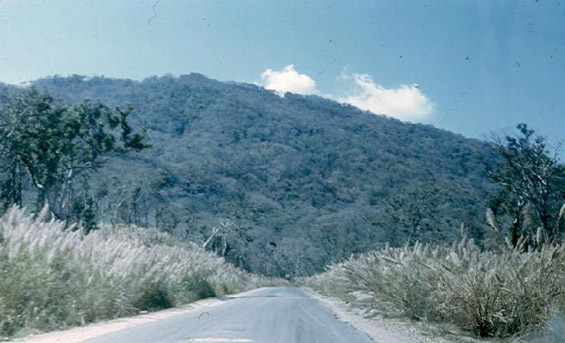 The 3rd Brigade base (LZ Montezuma) is clearly seen over the top of the "porch" and at the base of the hill. Good food in the field is key to good morale. 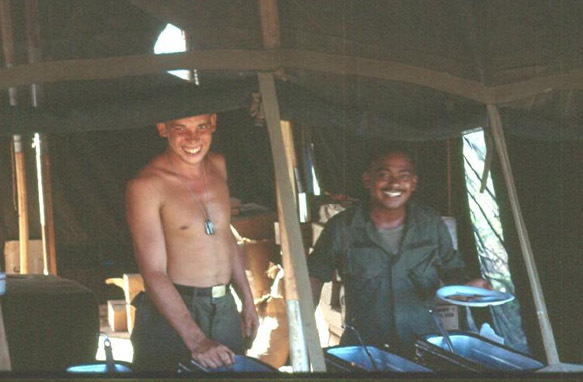 Above PFC Alvin Hite and SSG Frank Venegas give bright smiles as they fill their plates. SSG Venegas became the CSM for III Corps Artillery at Ft Sill after his tour in Nam. 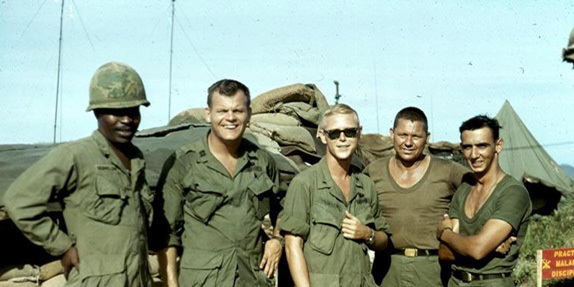 The Leaders: WO Emil Franklin, Cpt Mike Casp, Lt Dennis Munden, 1SG William Rollins, Lt Dennis Dauphin. WO Franklin was the Radar Officer, Cpt Casp was the Battery CO (later KIA, Nov, 1967) Lt Munden was the Fire Direction Officer (FDO), 1SG Rollins was the TopKick, and Lt Dauphin was the Battery Executive Officer (XO). Sign in rear says "Practice Malaria Discipline". The Bell "Bubble" helicopter...generally reserved for Battalion Commanders and above. Since most discussions were held over an encrypted radio net, the "boss" coming out for a personal visit was not often a good sign. The .45 caliber sidearm was the tool of last resort. Consequently, it was kept clean and ready to use. Lt Dauphin taking aim at practice targets. 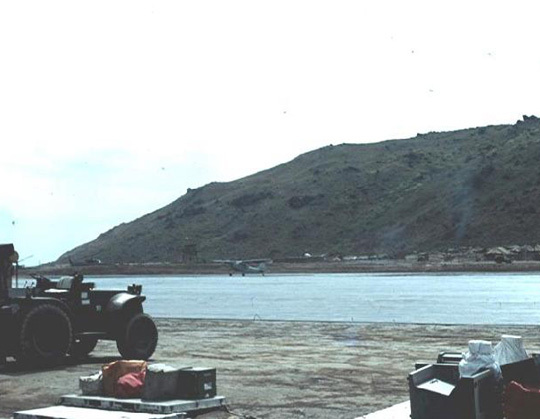 LZ OD had a clear and direct view of the 3rd Brigade, 25th Infantry Div Headquarters at the base of the hill in the background. Farmers working their rice paddies every day provided a paradox of daily working life in a war zone. There were no accessible roads. Helicopters ruled the day. 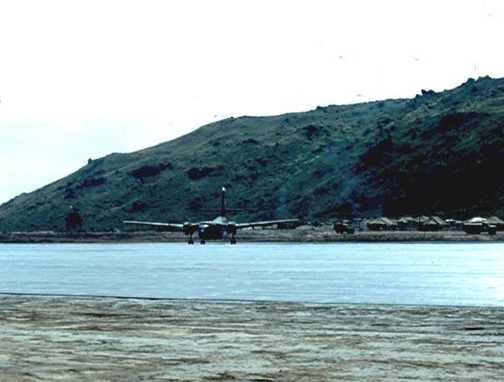 The Brigade airstrip runs parallel to the base of the hill. Cam Ranh Bay...the Journey back home begins The 6th Convalescent Center at CRB. Fortunately, I was just a visitor. Wounded combatants that could be treated "in-country" were sent here to recuperate. It was nearby to the barracks holding the "incoming" and "outgoing" soldiers.